Satellite communications systems rely on orbiting satellites to provide reliable wireless transmission, in conjunction with the ground-based infrastructure that delivers a wide range of narrowband and broadband services. This ground segment comprises major earth stations and user terminals that have been configured and optimized for cost-effective fixed and mobile applications. Owing to the diversity of new applications based on the Internet Protocol and the DVB-S and S2 and MPEG 2 and 4 series of standards and the availability of high-power satellite capacity on a global basis, these systems have become vital to users in both the commercial and government sectors. 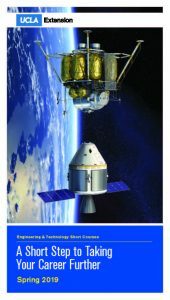 This course presents a comprehensive, up-to-date development of ground segment engineering principles and practical techniques for satellite communications engineers, earth station developers and operators, enterprise network engineers, electronics maintenance engineers, and providers of voice, data, video, and Internet services with GEO and non-GEO satellites. Instruction addresses earth station design, user terminal configuration and production, and facility design and operation, providing a detailed and integrated understanding of how to proceed with complex projects. Of particular interest are compact terminals for portable and mobile (on-the-move) applications. Throughout the course, emphasis is on the latest technologies and techniques, particularly in the areas of digital communications and standards, RF and wireless design, bandwidth-efficient modulation and modern forward error-correcting codes, and production of a workable ground-based facility that meets both current needs and future requirements. Course methodologies and examples come from a variety of applications in satellite communications and networking, including fixed and mobile voice and data, Internet services via satellite, digital video and audio broadcasting, high-speed delivery of broadband and multimedia content, and international telecommunications services that integrate both satellite and land-based cable and wireless systems. These capabilities apply to commercial as well as government military and civil uses. Throughout the course, participants are encouraged to ask questions and discuss the specific issues that they face on the job. The text, The Satellite Communication Ground Segment and Earth Station Handbook, B. Elbert (Artech House, 2001), and updated lecture notes are distributed on the first day of the course. The notes are for participants only and are not for sale. Bruce R. Elbert, MSEE, MBA, President, Application Technology Strategy, Inc., Thousand Oaks, California; and Adjunct Professor, College of Engineering, University of Wisconsin, Madison. Mr. Elbert is a recognized satellite communications expert and has been involved in the satellite and telecommunications industries for over 30 years. He founded ATSI to assist major private and public sector organizations that develop and operate cutting-edge networks using satellite technologies and services. During 25 years with Hughes Electronics, he directed the design of several major satellite projects, including Palapa A, Indonesia’s original satellite system; the Galaxy follow-on system (the largest and most successful satellite TV system in the world); and the development of the first GEO mobile satellite system capable of serving handheld user terminals. By considering the technical, business, and operational aspects of satellite systems, Mr. Elbert has contributed to the economic success of leading organizations in the field. He has written seven books on telecommunications and IT, including The Satellite Communication Applications Handbook, Second Edition (Artech House, 2004); The Satellite Communication Ground Segment and Earth Station Handbook (Artech House, 2001); and Introduction to Satellite Communication, Second Edition (Artech House, 1999).